When it comes to deciding on a new entry door for your home, you have many options available to you. An entry door must be both beautiful and sturdy. It must exude class as well as resilience and security. Many factors go into building the perfect entry door. This gives homeowners in the Southwest the liberty to create something truly unique. A new entry door will increase your curb appeal and reinvigorate your home’s facade. Trim Team is ready to help you make the best decision on the material, style, and features for your entry door. 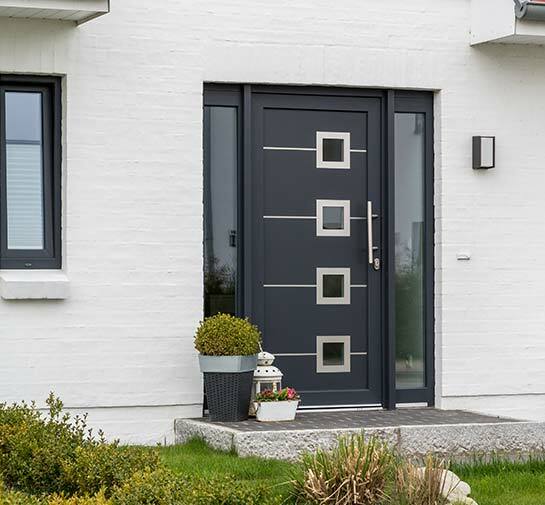 The go-to materials for entry doors are fiberglass and steel. Each one offers a variety of positive attributes. Deciding on the door material depends on your own specific needs. Regardless, you’ll be able to feel confident in knowing that your choice will be long-lasting and dependable. Weather-resistant, tough, highly customizable, fiberglass is one of, if not the most popular entry door material option available today. It can be painted to look like natural wood but it won’t warp or rot like wood. This high-class, high quality option is an excellent choice for homeowners who want only the best. A more affordable option, steel doors are an excellent choice for homeowners in the Southwest. Steel doors constantly rank as the safest option. On top of being incredibly safe, steel doors are great insulators and protect your home from unwanted cold drafts, thus saving you on energy bills in the long run! An entry door isn’t complete without a few necessary features. Trim Team provides all the necessary accessories that will make your dream entry door come to life. High-quality features can transform your current entryway from casual and expected to gorgeous and breathtaking. Once you’ve decided on the material that will make up your door—be it fiberglass, steel, or natural wood—it’s time to decide on the finish of the door. Trim Team offers a variety of stain finishes that will transform the look of your door. Best of all, our stain finishes will retain their color and luster for years and years. Whether you’re looking for a contrasting color that will make your door stand out or for a more natural stain, we can help. El Paso is known as the Sun City, after all. Why not use that near-constant sunlight to your benefit? With decorative glass, your entry door will welcome sunlight into your home. There are many decorative glass options available to make your entry door truly original. If you’d like to welcome even more natural light into your home, consider sidelights! These small windows basically wrap around the area of the entry door, maximizing the entryway’s light and view. Odds are you’ll be using your entry door’s hardware on a daily basis so why not make that hardware look and feel beautiful? High-quality hardware must keep your home safe and secure, all while working efficiently for years to come.